When we saw a story on ESPN.com about Dean Smith we were tempted to overlook it particularly after the John Feinstein story that we linked to on Monday. We are glad that we did because Tommy Tomlinson’s article on Smith, his failing memory, and the people who stand by him is probably the best thing you will read all day. As we mentioned on Monday, we cannot remember anybody saying something negative about Smith on a personal level. If you were not aware of why that is, this article and the anecdotes within it should explain it. With Wichita State finishing the regular season undefeated, Matt Norlander decided it was time to compare this Wichita State team to the 2004 St. Joseph’s team, which was the last to go undefeated in the regular season. That 2004 team, which was led by Jameer Nelson and Delonte West, ended up losing a game in their conference tournament so Wichita State could make it a step further than them by the start of the NCAA Tournament. While it might be interesting to compare the two teams numerically they are very different teams. The Shockers certainly have their share of well-known players, but are overall a much more balanced team that that St. Joe’s team. In the end, the way that most people will remember this Wichita State team will be scripted in the next month. We already read Mike DeCourcy’s response to Mark Cuban and now Larry Brown, a man who has plenty of experience at both the college and professional level, has decided to respond to Cuban’s comments that the NBDL would be better for player development than the NCAA is. Brown, who is actually based in Dallas now as the head coach at SMU, strongly disagreed with Cuban and said that the coaching players get at the NCAA level is vastly superior to what they would get in the NBDL. We can certainly agree with that assessment at SMU under someone like Larry Brown although we would not be quite as sure about that at some other colleges. We are getting to the point in the season where people are starting to seriously look at end of season individual honors. Some awards like National Player of the Year are all, but locked up (the flight attendants on planes going to Omaha might want to start making space in the overhead bins). Most of the others are up in the air. With that in mind, Seth Davis took a look at the races for player/coach/freshman of the year in each of the major conferences. We tend to agree with Davis’ picks here, but we wouldn’t be surprised if there were some differences in the final decisions on some of these awards. 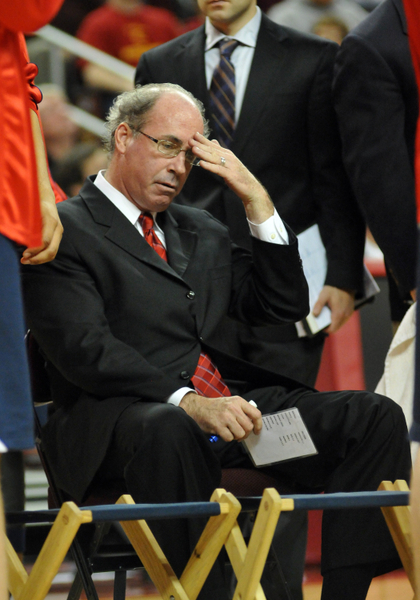 Some of you may remember Russ Pennell from his brief stint as head coach at Arizona when he took them to the Sweet 16 in 2009. Since that time Pennell served as head coach at Grand Canyon State University (yes, the one that caused the uproar recently) and the Phoenix Mercury of the WNBA. Now, Pennell is returning to Central Arkansas, where he played in college, to become the team’s new head coach. If you seem surprised that the name of a Southland Conference team seems familiar is because you may have heard of them when Corliss Williamson was briefly the coach there. Or perhaps you may have heard of one of their former players–Scottie Pippen. I’m beginning to think that there is some bizarre Arizona–USC connection going on after USC announced that former interim Wildcat coach Kevin O’Neill was going to take over as the Trojans new head coach. You may remember O’Neill from the Lute Olson fiasco after the 2007-2008 season, but O’Neill also has prior coaching experience at the college (171-180 in 12 seasons) and pro level (helpful if you’re running a program like the one Tim Floyd apparently ran in LA the past few years). O’Neill takes over for Olson on an interim basis, but then Lute stabs him in the back and comes back for a short period before eventually retiring. O’Neill goes to work for the Memphis Grizzlies for a season. Arizona hires Russ Pennell to take over for Olson after O’Neill is let go. Tim Floyd guides the Trojans to respectability before O.J. Mayo comes to town. The Trojans manage to make it back to the NCAA tournament the year after Mayo leaves. Arizona decides not to renew Pennell’s contract and starts searching for big name to take over. They decide on Floyd, who briefly decides to take the job before changing his mind. Arizona eventually hires Xavier head coach Sean Miller. Floyd resigns leaving USC scrambling to find a head coach as it loses multiple recruits who decide to go to other programs. USC gets turned down by several big names including Jamie Dixon and Reggie Theus before selecting O’Neill. O’Neill led the Wildcats to a 19-15 record and yet another NCAA tournament bid in his single season in Tucson, but according to some sources had difficulty connecting with the Wildcat players. While that may be a problem at some programs, I’m sure that the administration at USC will appreciate having a coach of one of their two major programs who follows the rules. While we would normally consider USC one of the best positions in the country, O’Neill has his work cut out for him with recruits leaving in droves and NCAA sanctions on the horizon. Would the word flood be an appropriate representation? Early Entry Fatigue. LSU’s Tasmin Mitchell will test the waters, but he won’t sign with an agent. Ditto for Memphis’ Shawn Taggart. And Miami (FL)’s Dwayne Collins has the same idea. UCLA’s Jrue Holiday is a bit of a surprise given how he struggled at the end of the season, but he too will take a dip. Curry Watch. One player who has yet to throw his hat in the ring is Davidson’s Stephen Curry. Will he be back to make a run at Pete Maravich’s all-time scoring record next season? Nice raise. Alabama’s new coach Anthony Grant will earn $1.8M annually through the term of his seven-year contract. Nobody? It’s really hard for us to believe that nobody currently in D1 wanted this guy after he did a pretty good job keeping the Arizona program together this season. Xavier Coaching Search. Word is that assistant coach Chris Mack is the most likely candidate to take over for the departed Sean Miller. Update: Apparently, the mainstream media is no more reliable than blogs as ESPN was completely wrong about Floyd accepting the Arizona job. Instead, he has decided to stay at USC perhaps comforted by the fact that he has Mike Dunleavy coaching in the same city to make him look like a coaching genius. After unsuccessfully trying to woo Rick Pitino and reportedly going after Mark Few and Jeff Capel, Arizona is set to name Tim Floyd as its new head coach according to reports. In the wake of the Lute Olson fiasco last off-season, the Wildcats turned to Russ Pennell to lead the team as an interim head coach. Along with Mike Dunlap, who acted as a co-coach, Pennell guided the Wildcats to their nation-leading 25th consecutive NCAA tournament appearance (if you ignore trips that were later vacated). The Wildcats, who in the eyes of many had underachieved all year long with one of the nation’s most talented trios (Nic Wise, Chase Budinger, and Jordan Hill), managed to get to the Sweet 16 with victories over Utah and Cleveland State before getting crushed by Louisville by 39 points to end the season. 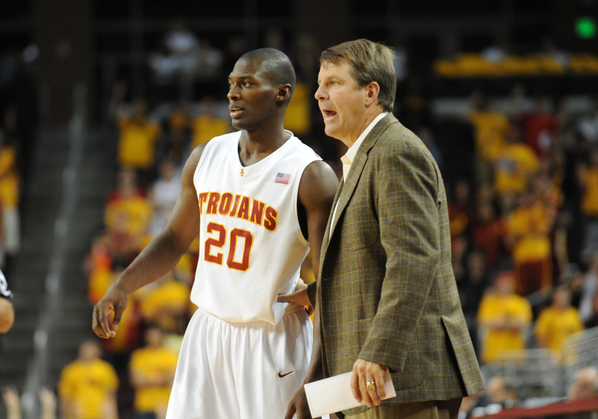 Floyd built his coaching reputation at Iowa State where he is the only coach in the program’s history to lead them to 3 consecutive 20-win seasons as he finished his 4 years there with a 81-49 record. However he is most well-known nationally for picking up the scraps of the Chicago Bulls team following the departure of Michael Jordan, Scottie Pippen, and Phil Jackson, has only been moderately successful at USC making it to the NCAA tournament his past 3 years including a trip to the Sweet 16 two years ago. Floyd’s first order of business when he takes over in Tucson will be to try to convince his 3 stars to come back next year. If he is able to do that, the Wildcats should be able to make the NCAA tournament. Once he does that he will need to start recruiting again as the Wildcats’ recruiting has fallen off considerably with all the uncertainty regarding their coaching situation the last 2 years. John Calipari Headed to Lexington. Officially. What does this hire by Kentucky (at a reported $5M+ per year) do? It makes the Wildcat program nationally relevant again. Instantly. With a single stroke of the pen (still pending), every major recruit from 9th to 11th grade (and several in the 12th) who has visions of wearing a hideous suit to meet David Stern on Draft Day suddenly has Kentucky back on their radar screens. At the McD’s game practice today, Xavier Henry has already made it clear that his recruitment is open “to everybody and anybody.” Another Memphis commitment, DeMarcus Cousins, may feel the same way, and who knows where this leaves John Wall (a strong Memphis lean)? With arguably the strongest recruiter this side of Roy Williams and Ben Howland vacuuming up numerous kids with serious dreams of the L, and the commitment to resources that a school like UK brings to basketball, is there any doubt whatsoever that The Squid will have the Cats hunting for Final Fours again very soon? The pressure to win and win big will be gargantuan, but Calipari is one of the few coaches with enough ego to handle it. Domino, Motha____ers! And like Doughboy so eloquently stated in BnTH, the dominoes are already falling elsewhere. Georgia reportedly offered over $2M per year to Missouri’s Mike Anderson (although others dispute that) to take over the chronically underachieving Bulldog program, but now there is chatter that Anderson might have an interest in the newly-opened Memphis position. Update: Anderson is staying at Mizzou for a payday nearly doubling his annual salary. Some other names being thrown around for the Memphis job are Tony Barbee from UTEP (former Calipari assistant) and even former Arkansas Razorback coach Nolan Richardson, who regularly mined the playgrounds of Memphis for his stellar 40MoH teams. Whoever takes over this job, a top 20 destination, will be without the services of Tyreke Evans, who also announced his decision to go pro today. The Other Ego in Kentucky. Louisville figures to be impacted heavily by the arrival of Calipari at Kentucky, if for no other reason than to escalate a rivalry between coaches that goes back to the early 90s and into the NBA (Celtics vs. Nets). Can you believe that two titans of ego coaching such as Pitino and Calipari – both hot-blooded Italians – will be battling for bragging rights in the same basketball-nutty state? Still, if you believe in rumors that won’t die, there is speculation that Rick Pitino is a legitimate candidate for the open Arizona job, vacated by Lute Olson and seat-warmed by Russ Pennell this year. Seth Davis wrote today that he doesn’t believe this rumor for a second, and neither do we, but we could definitely see the other name mentioned for this job, Gonzaga’s Mark Few, getting into the mix down in the desert. Final Question. It’s not like Billy Gillipie was completely shamed out of Lexington, although it certainly played out so. Still, the guy has a relatively strong coaching resume, and unlike some other epic failures at regal programs (Matt Doherty at UNC; Steve Lavin at UCLA), he’s proven that he can build a program and recruit players to fill those spots. So where will Billy Clyde end up? You have to figure that he’ll be back in coaching next year, and if you saw his interview on ESPN with Jimmy Dykes yesterday, it was painfully apparent that he’s angling for another position with the ‘aw shucks’ persona. Just so long as he doesn’t have to give any advice, cuz, you know, he’s not an advice-giver. Dykes: Do you think not signing a 30-page contract is gonna affect what you feel is fair to you at this point? Gillispie: Oh, I have no idea. I mean, I think it’s all gonna work out fine, and I’ve never been involved with too many things that didn’t. 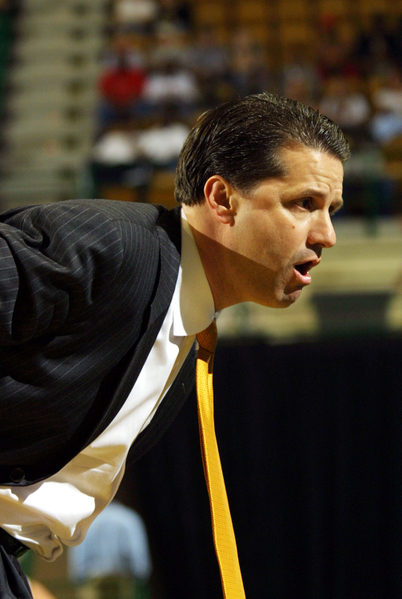 Dykes: What advice would you give to John Calipari if the deal goes down? Gillispie: I’m not an advice-giver. I heard a long time ago, “The worst advice is bad advice … or giving advice.” And so, I don’t really have a whole lot of advice. Just another night of highly ranked teams playing as if they don’t want to be a high seed. However, I am always on top of my game and I bring 110% to the Fast Breaks everyday. So sit back, relax, and let me do the work for you. Rivals takes an expansive look at each and every conference tournament. Who better than Kyle Whelliston to recap all the conference tournaments that have already started. CBS’ Mike Freeman takes a fantastic look at why Blake Griffin isn’t receiving the same attention Tyler Hansborough did last year. Jameson Fleming tries valiantly to explain why Baylor continues to underachieve. Gary Parrish says forget tournament expansion, with the way these bubble teams are playing, we should think about cutting it in half. Sure, lets throw Northwestern onto the bubble. Bring’em on!!! The more merrier. Please Mr. Goodman, slow down your bubble watching, I am not yet in tournament shape for all these bubble watches. Math and statistics has helped us prove that college basketball is the hardest sport to win at on the road. Despite what Russ Pennell has done at Arizona, the Wildcats are looking for someone who has “had success at the highest level”….I am sorry, what level does Arizona play again? We made fun of Paul Harris for his in-game dietary habits. But he also managed to make some ridiculous plays as well. Will Duke being playing shorthanded against UNC? They better hope Lance Thomas and Brian Zoubek get healthy and fast. Hey all, its your faithful intern here trying to bring you the best reading material from across the interweb. You may not have noticed, but there was no Fast Breaks yesterday, so today’s will be longer and will dip into yesterday’s stories as well…Enjoy!! The Washington Post questions the legality of Under Armour’s relationship with Maryland and Lance Stephenson. Jim Calhoun just can’t escape his infamous press conference, now legislators are getting involved. Terrence Williams isn’t just a versatile forward. Apparently, he is also the team comedian. Shawn Siegel has his new version of Bracketology out. Former Syracuse star Damone Brown was busted as a part of a cocaine ring. Andy Staples of SI takes an interesting look at how Jim Calhoun‘s salary stacks up against some other CEOs in business. Seth Davis answers his mail and takes a peek at Top 10 candidates for coach of the year, although personally I don’t know how you can select Arizona‘s Russ Pennell. You think Robin was the best sidekick ? Let’s see how these college basketball sidekicks measure up. While the UCONN men are looking to stay atop the polls, the women finished up their regular season undefeated. Bizzaro Joe Lunardi takes his March 2nd look at what his namesake has in his newest bracket. No matter what URI head coach Jimmy Baron says, it will be tough to make a case for URI in the tournament if they don’t win the A-10 tournament. St. Mary’s can thank their lucky stars as they will welcome back star guard Patty Mills just in time for the WCC tournament…Look out Gonzaga. Uh-oh. Former UK player Mike Casey threw head coach Billy Gillispie squarely under the bus in a recent interview. Lute Olson compiled a 43-6 record against Arizona State. Since he took a leave of absence last year, Arizona is 0-4 against the Sun Devils. Against ASU, Jordan Hill, Chase Budinger, and Nic Wise all logged 40 minutes. For the year the three are each averaging over 35 minutes a game. They are the only team in the Pac-10 with three players averaging over 35 minutes a game. Come Pac-10 tournament time these three horses have to be tiring. Oregon State swept the season series against Cal for the first time since the 1994-95 season. Jerome Randle has 59 three-pointers this season putting him 9 shy of the school season record 68 set by Ryan Drew in 1990. With four games left and Randle averaging over two a game he stands a fighting chance at overtaking Drew. Washington State’s win at UCLA last week was only their second win in their 53 games at Pauley Pavilion. The battle for coach of the year in the Pac-10 has four solid candidates. With the jobs Mike Montgomery, Russ Pennell, Craig Robinson, and Lorenzo Romar have done, there is an excess of candidates to choose from. Pennell is the front-runner right now in my mind. He turned this Arizona team around and has them at 8-6 in the Pac-10 and 18-9 overall. He was the second choice for interim coach in late October. Last year he did color commentary for Arizona State radio network. Jon Brockman is the only mid-season candidate for the Naismith trophy from the Pac-10. Rochestie scored 24.5 points a game for Washington State this week. Rochestie also averaged five rebounds and four assists a game. Rochestie scored 33 points in WSU’s upset of UCLA. He shot 5-for-7 from three-point range and a perfect 10-for-10 from the free throw stripe. Collison scored 18.5 points and averaged 6.5 assists for UCLA this past week. Collison went a perfect 7-for-7 from the line in the two games. Kuksiks scored 17 points in Arizona State’s win this week. Kuksiks scored 15 of those on five three-pointers. Quick… what’s the term for the opposite of good basketball IQ? A Stephon Marbury? What do you call a player who consistently makes abominable, indefensible and atrocious decisions on the court? A Derrick Coleman? Well, step aside Bonehead Brethren of Years Past, because there’s a new sheriff in town, and his name is Jamelle Horne. The Arizona sophomore, through his complete and utter obliviousness at the end of two key games this year, may have singlehandedly ensured that his school will not play in the NCAA Tournament for the first time in a quarter-century. Arizona now sits at 11-7 and eighth place in the Pac-10 (2-4) after getting swept by the SoCal schools over the weekend. Their RPI is currently #52, the ship appears to be taking on water, and at this point it’ll take a herculean effort for Russ Pennell to get Arizona back into the mix as a realistic at-large candidate. But what if instead of 11-7 (2-4), the Wildcats were currently sitting at 13-5 (3-3)? You’d have to figure they’d be getting votes in both polls as well as being talked about as a dangerous team in the second half of the season. 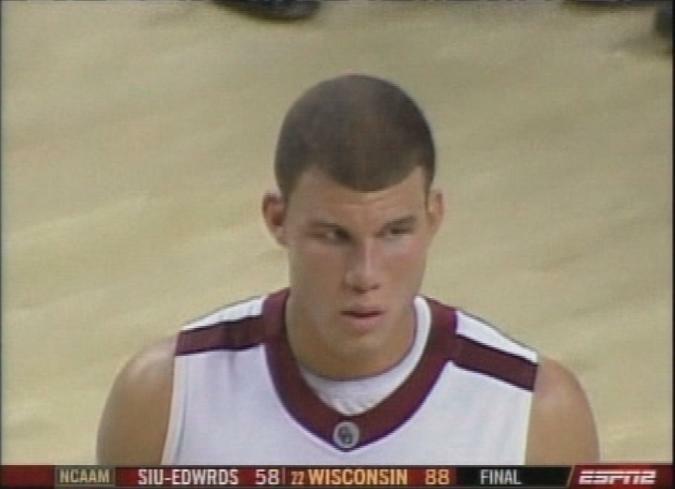 Immediately after Hackett crossed the midcourt line, Horne ran into the USC guard with 1.2 seconds left. Having only a prayer of a chance at a game-winning field goal, Hackett instead was given two free throws. He made the first one and that was all the Trojans needed. Problem was, for Arizona and Horne, the game was (once again) TIED. If we were Russ Pennell, we’d strongly consider putting Horne through a battery of memory tests to determine if he has the mental capacity to remember something for longer than two seconds. Either that, or just sit the kid down at the very end of his bench for the last minute of every game. It’s simply astonishing that the same player could make such an egregious error twice in a single year, costing his team two Ls as a result. Time and score, time and score, time and score… how many times did we hear that growing up? Either Horne really is not a very bright bulb… or he’s gotta have something else going on. note: we couldn’t find video of the incident, so this walkthrough vodcast will have to suffice.